Which airlines fly to Juanda International Airport? There are more airlines flying to Juanda International Airport. See here for a complete list of airlines flying to Juanda International Airport or look for flights to Surabaya. How many runways and passenger terminals does Juanda International Airport have? There are two terminals at Juanda International Airport: Terminal A handles all international flights, while Terminal B is for domestic. The international arrival and departure hall is on the west wing and the domestic terminal is on the east wing. In the centre you can find the information centre and the shopping arcades. Two new runways and two new terminals are currently constructed and are expected to open in 2019. Where is Juanda International Airport located? 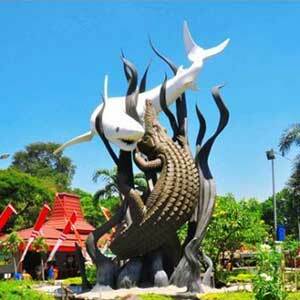 Juanda International Airport (SUB) is located in Sidoarjo, about 10 km south of downtown Surabaya. How to get from the airport to Surabaya city centre by public transport? By bus: Damri air conditioned shuttle buses are available in front of the domestic terminal, near the parking bay. The fare is Rp 20,000 and the bus will take you to the Purabaya Bus Terminal (the locals call it Burgarasih Terminal), which is about 10km south of the city. Depending on traffic, this will take around 30 minutes. The operating hours are from 4am till 7pm. How much does a taxi cost from the airport to Surabaya city centre? Taxis are widely available outside the terminal building. Primkopal Juanda taxis operate on a flat-fee rate to various destinations in Surabaya for around Rp 100,000-150,000 depending on your exact destination, add on another Rp 8,000 for toll road fees. Often you may be able to get a driver dropping off passengers to pick you up, which is cheaper. What are popular destinations from Juanda International Airport?